From Stoichkov to Romario, Messi to Iniesta, the city of Barcelona has been lucky enough to witness some of the greatest players ever to play the beautiful game. One of the world's most famous footballing cities, playing host to the Camp Nou, Barcelona is one of the most attractive places to play soccer. The most famous team who play in Barcelona are known as Blaugrana due to their blue and red home jerseys. 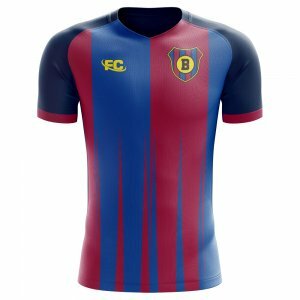 This jersey is an unofficial concept kit, which pays tribute to the footballing heritage of the city of Barcelona. It is designed by a Barcelona resident and is perfect for supporters to show their love with an unofficial fan jersey.